Get help finding the right cruise line and right ship and identifying the sea life below and the stars above. Anyone planning a cruise these days quickly learns that major lines such as Disney, Norwegian and Royal Caribbean have their own smartphone apps to help passengers navigate their floating cities and discover onboard entertainment, spa services and ports of call. And for most travelers, that’s more than enough information. But if you wish to immerse yourself in cruise culture, there are a handful of apps that allow you to virtually explore dozens of cruise lines and hundreds of ships, stay on budget, even identify the tropical fish swimming below you and the constellations in the dark sky above. Some of the apps don’t even require an Internet connection, so you can play and learn without having to pay for onboard Wi-Fi. Here’s a guide to the most useful digital tools for a bon voyage. Cruise Ship Mate — A cruise countdown on this app encourages you to track the days, even hours, until you set sail and, if you want to brag, post it to Facebook or Pinterest. While anticipating your trip, you can see where in the world your ship is docked using the “ship location” feature and view snapshots from live webcams onboard, tips and details about excursions and shopping. The app, which highlights more than 300 ships on over a dozen lines including Carnival, Princess and Disney, also allows you to check out your ship’s features, chat with other passengers, read reviews of the rooms and food (and get advice about what to do) and see photos from ships and ports by fellow cruise-lovers. 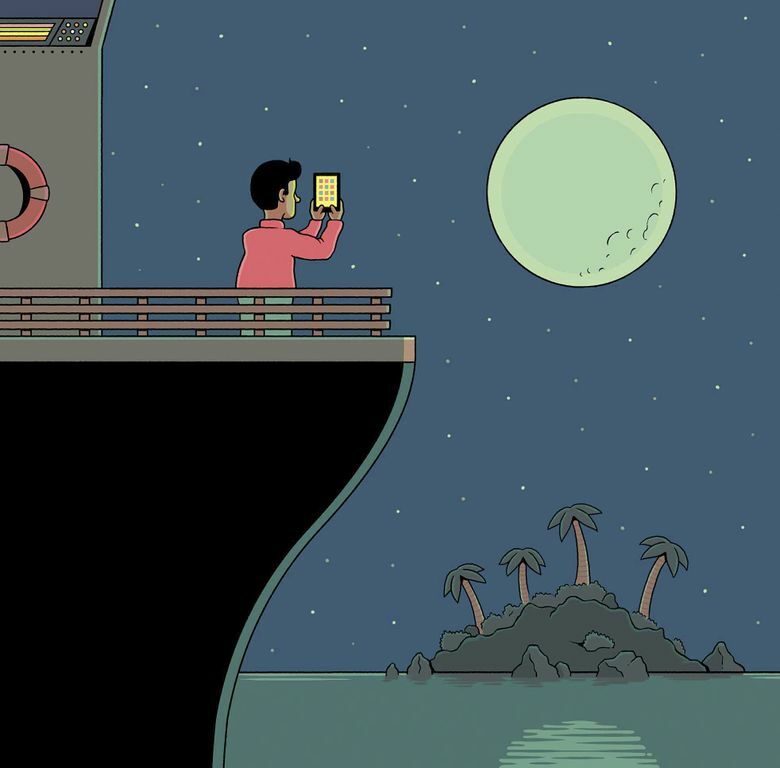 And if you decide to use the app at sea, you won’t get socked with roaming charges: It works without an Internet connection. Cruise Finder — This one’s mainly for helping you determine which cruise is best for you. You can search by destination, departure port or date. Free; available for iOS and Android. Wmphvacations.com. Cruise.com — Like others, this app offers ship information and deals, but if you’re a novice passenger you may appreciate the “prepare for your cruise” section with frequently asked questions aboutboarding procedures and visitor policies, as well as suggested packing lists. But for comparing ships, learning about cruise etiquette and procedures, and checking prices, it’s far easier to simply visit websites such as Cruise.com, CruiseCritic.com (a good place to find reviews and get up to speed about the nuts and bolts of cruising) andCruising.org (an industry website). Fishes: Greater Caribbean — While stretching out on a lounge chair on deck, this app allows you to learn a thing or two about what’s happening in the sea below. The app, from the Smithsonian Tropical Research Institute, helps you identify about 1,600 species of fish, thanks to some 5,500 colorful photos. The app works without the Internet. Star Walk — Once downloaded onto your iPad or smartphone, this popular augmented-reality app allows you to tilt your device toward the sky and see in real-time which stars, satellites and constellations you’re looking at. You can find out the names of stars and other celestial objects simply by tapping on the screen. You can also search for certain objects. And a sharing button allows you to snap a screen shot of the sky (as seen through the app) and post it to Facebook and Twitter, send it to someone as an email or save it to your camera roll.